Carmella and Emma wasted no time as they locked up in singles competition. The Aussie was eager to show off her new edge while the Princess of Staten Island was eager to bounce back from her loss to Blue Pants. Both women exchanged offense, but Carmella was in control for most of the bout. And at one point, Carm found a nice comfy seat on Emma’s back while she was on the second rope. But the dancing Australia did not have what it took to get one over on the Hottest chick in the Ring, as Carmella locked Emma in a head scissor submission forcing the quirky Diva to tap out. For an NXT Women’s match, this one was weak. It felt more like a main roster Diva’s match in that it was slow and seemed a bit clumsy. There were too many places where the match seemed to drag on and that’s saying something considering the match wasn’t that long in the first place. I expected better of Emma but it seems her time on the main roster has hurt her. Carmella is progressing nicely. You can tell she’s eager and hungry. She just needs a proper opponent to work against. This was the weakest match of the evening in that there seemed to be little chemistry between the two and it was hard to concentrate on as it kept failing to stay on point. Too many breaks in between the action. The Lone Wolf of NXT faced his biggest challenge to date in the Man That Gravity Forgot. Adrian Neville used his speed to avoid the more powerful Baron Corbin for the first half of the match. The former NXT Champion was a flurry of lightning fast kicks and areial moves that had Corbin on the defensive. But Baron adapted and caught Adrian with a clothes line that put an end to the offensive onslaught. The undefeated Corbin then began to wear down Adrian with hard hitting moves that kept the high flier grounded. It seemed as if Baron Corbin would be able to put Adrian away and advance to the finals, but the NXT Universe will never know. As the ref’s back was turned, Corbin was ambushed by Bull Dempsey. The wrecking ball of NXT introduced Corbin’s face to the ring post at a high rate of speed and then vanished as quickly as he appeared. Baron rolled into the ring and was met with a devastating drop kick from Adrian Neville who then his the second most beautiful move in all of the WWE, the Red Arrow (Seth Rollins’ Phoenix Splash being the MOST beautiful,) for the win. This match was entertaining. I will say that I enjoyed watching a much longer match with baron Corbin. This has been his longest match to date in NXT. It was interesting to watch him adapt against a faster more experienced opponent like Adrian Neville. I can’t wait to see what else is this young Superstar has in store for us. Next week at NXT Takeover: Rival, Corbin will take on Bull Dempsey in a No Disqualification Match. Surely one for the ages and again, NXT better be prepared for the havoc that those two men will unleash on Full Sail Arena. Adrian Neville never disappoints when he’s in the ring. And as always, a flawless Red Arrow made the match. There is certainly no love lost between these two former friends turned rivals for the NXT Women’s title. At the on set of the bell, Becky and Bayley locked up and immediately the Irish rocker began to attack the injured knee of her opponent. She held on to control of the match over her former running buddy, but Bayley battled her way back. She relentlessly attacked Becky and was even able to lock in a half crab that nearly got the red head to tap. The Boss, Sasha Banks made her way down to the ring as a show of support to her Team BAE partner, but it back a distraction from the baddest Diva in NXT ended up causing Becky the match as Bayley landed a Bayley-to-Belly suplex for the win. Becky and Sasha later shared some heated words and eventual shoving match but the appearance of Charlotte ceased everything. The four women involved in next week’s four way match for the championship stared each other down as tensions built for all involved. It was made clear it will be every woman for herself come NXT Takeover: Rival. This match more than made up for the crap-tacular display of women’s wrestling at the beginning of the night. This is how it should always be done. There was nothing boring or dull about this match and the story that was continued is still as interesting now as it was when Becky first turned on Bayley. There is so much past history between all four women in the up coming match that it is a must see of the NXT Universe. It is very much up in the air with no solid favorite over who will come out of next week the champion. 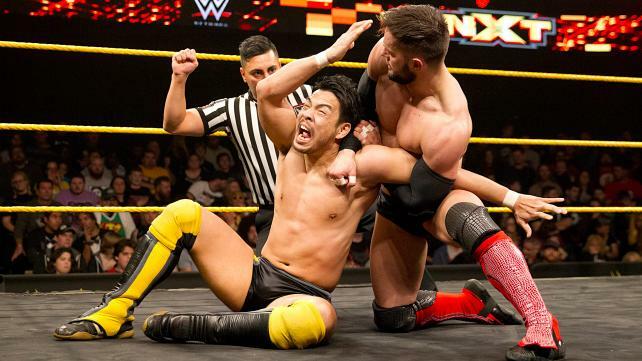 In what would be the best match of the night, Finn Balor and Hideo Itami put their friendship aside and squared off against on another in the Semi Finals of the #1 Contender’s Tournament for the NXT Championship. It was a high speed chain wrestling clinic as each man showed how well he knew the other with counter after counter. As soon as one seemed to have the upper hand, a move would be reversed and they were back at square one attempting to regain the little bit of momentum they just had. The NXT Universe was firmly behind both the Irish Demon and the angry Japanese man and rightfully so. Late in the match, Hideo laded a corner drop kick but as he went to lay another viscous kick onto his former tag partner, Balor countered with the Sling Blade that ultimately turned the tides in his favor. Shortly after that Finn hit a drop kick that catapulted Hideo into the corner where his head bounced off the turn buckle knocking him into dream land. The nail in the coffin for Hideo’s championship dreams came in the form of a double foot stomp and the pin, that would send Finn Balor to face Adrian Neville next week at NXT Takeover: Rival. After the match, Finn Balor offered his hand to his friend Hideo to show no hard feelings were held. Hideo accepted the offered hand and showed that he too, had no ill feelings towards the Irishman. As Finn made his way up the ramp, he was met by Adrian Neville. The two stared at each other and then shook hands. This match was too good for words. On more than one occasion the NXT crowd chanted what I was feeling in the forms of “we are not worthy,” “This is Awesome,” and a personal favorite “Better than Raw.” (Sorry ,main roster but NXT is amazing and you have alot to live up to. Well… Not Seth and a few others, but they came from NXT so point still stands…. Just saying >.>) This is one of those matches that I will go back and watch over an over and still catch things I didn’t notice before. So much went on with the counters and the reversals. The action was non stop could have gone on longer and not been boring in the slightest. The NXT Universe witnessed something special and I can’t wait to see what gem of a match Adrian and Finn give us next week. This entry was posted on Thursday, February 5th, 2015 at 7:34 pm	and is filed under Events, News, Television. You can follow any responses to this entry through the RSS 2.0 feed. You can skip to the end and leave a response. Pinging is currently not allowed. « Check Out the New Trailer for the ‘Poltergeist’ Remake! !